There have been an absurd amount of accusation and allegations being thrown around in this election, so much so, that to some degree they all begin to lose their relevance. Of all the misdirection being attempted, it is paramount that the American people come to one unfaltering conclusion: That it does not matter where these hacks and leaks come from–the Russians, the Chinese or the moon–it only matters whether or not they are true. 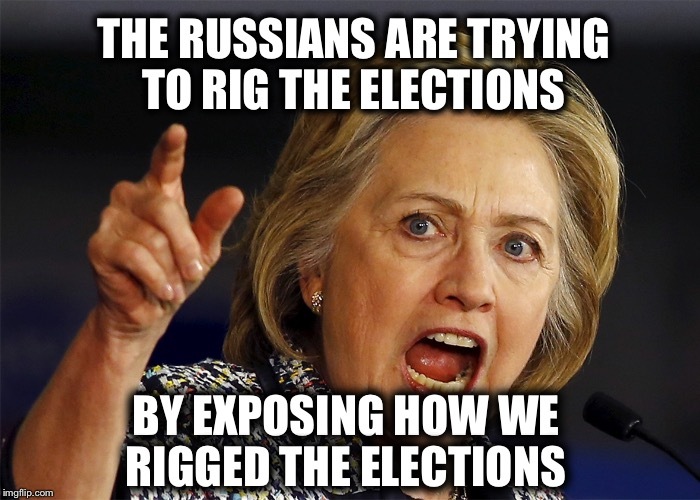 Because, if so, how can the accusation truly be that the American people should be upset that the Russians, or anyone for that matter, attempted to rig the election … by telling the truth? Yet sadly, that’s the one point few will address; they instead shift focus onto the unnecessary question of where they came from, in hopes that the people simply forget to ask themselves whether the information is valid. This is to intentionally redirect the people’s attention away from the real meat of the matter; that Clinton and her campaign are rife with political manipulation, and illegal activity that diminish what’s left of American political integrity with every illegal act. Sadly, American politics have long-since been lost to special interests and corporate control, so none are too keen on blowing the lid off these revelations, as too much money is being made by democrats and republicans alike. And mainstream media is all too happy to play along. Will you allow yourself to be misdirected with such ease? Will you forgo the one question we should all be asking ourselves? Or is it that we are simply too afraid of the answer? I think both issues are important. The content of the emails was damning and any repercussions from what was exposed was justified. If that cost Clinton the election, too bad. However, I also think that it is important to investigate the hack, determine the perpetrators, and have some kind of response. If it was domestic, arrest them. If it was the Russians, retaliate appropriately. If it was just a leak as some have suggested, then oh well, good for that person for exposing the truth. I’m not a Trump supporter, but I think his call to the Russians to continue their hacks was tongue-in-cheek and not as insidious as his opponents are making it out to be. Therefore, I hope he demands an official report from the CIA and/or the FBI concerning the DNC hack. We can’t rely on anonymous leaks from the CIA.